In this scenario, Lazarus was gifted or cursed with immortality, although most theories in Church history (there’s no Biblical record of what ultimately happened to Lazarus) have him aging normally and finally dying of natural causes. The question is whether or not this is the true Lazarus or someone suffering from a strange delusion. He’s at once a reluctant hero and a prostitute-for-hire by high-end male clients, but while his identity as the Biblical Lazarus is left a mystery for most of the book, he does have a startling secret involving a terminal brain tumor (which you wouldn’t expect of an immortal) and a seven-year-stint in suspended animation. He also has an ax to grind with the Pope, who happens to be making a tour near where Lazarus is living in the UK. Spoiler alert time. If this were the true Lazarus, he would probably be using his Hebrew name Eleazar since he admittedly comes from the Middle East. Reid hints that he observes some form of kosher, in keeping with his being Jewish (if he is the real Eleazar), but his understanding of the brother of Mary and Martha from the New Testament is much more Catholic than Jewish, which makes sense if he had a long and close relationship with a Priest. That isn’t a flaw in Reid’s novel, but I had to wonder if the rogue doctor who put him successfully in suspended animation for seven years had really perfected the process, you’d think he’d cash in on it, even though he had been disgraced by the medical profession for his theories and practices. Of course, in real life, putting someone in cryogenic freeze prior to their actual demise is considered homicide, which is why people with terminal illnesses who have paid for this process, must wait for their disease to end their lives before being frozen (in many cases, to save on costs, only their heads are frozen with the reasoning that a new body can be grown for them when technology becomes sufficiently advanced). Also, the plot to assassinate the Pope almost, but not quite, comes out of left field, and the plan and execution of the attempt is practically a let down. I think this part of the book could have been stretched out a bit to build even more suspense. All that said, it was a very satisfying read and a real page turner. I also appreciate an author who isn’t afraid to write speculative fiction with a religious twist. So many writers creating stories in the mystery, fantasy, and science fiction genres are afraid to the point of phobia to explore religious and spiritual themes because they fly in the face of progressivism and anti-religious biases in the publishing industry. This is exactly why such stories have a wide open niche in the marketplace, and I applaud Reid for nicely slipping his tale into that space. 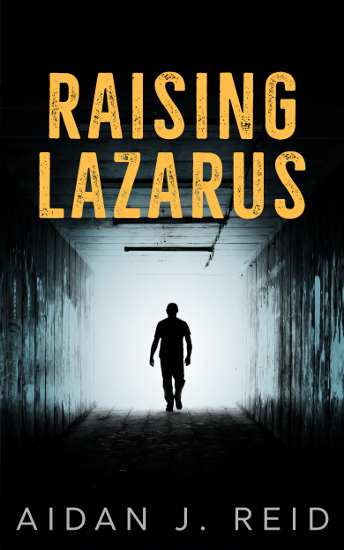 I wholeheartedly recommend “Raising Lazarus” as well as Reid’s other books. By the way, he’s currently authoring the sequel to “Sigil,” which I’m really looking forward to reading. I’m going to copy this review into Amazon just so you know. Nice review. And I too applaud the author for being willing to explore spirituality, especially through ways that aren’t exactly traditional. Traditional? Where’s the fun in that?